More Ergenekon-related drama unfolded this week when 28 active and retired military personnel were detained. These detainess are reported to be linked to retired police chief Ibrahim Sahin who was charged in 2009 as an Ergenekon conspirator, though the detentions were not explicitly linked to the Ergenekon investigation. On Friday, an Istanbul court indicted 33 suspects accused of being part of the Cage Plan, including three retired admirals. The week started with a bang when the Sunday edition of Milliyet ran an interview with Chief of General Staff Ilker Basbug, wherein Basbug said Operation Sledgehammer (see Jan. 25 post) was the most serious of the various coup plans and confirmed that the military was conducting a "comprehensive and multi-dimensional" probe of Colonel Cicek, who is accused of masterminding the "Action Plan Against Reactionary Forces." 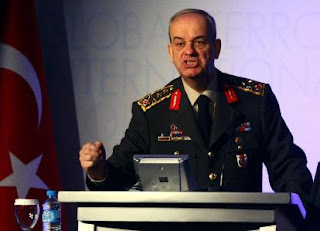 Meeting with journalists on Monday, Basbug gave a highly-charged speech in which he told reporters he was in "a challenging mood" and, according to Today's Zaman, warned journalists they could face charges for reporting stories that undermine relations between superior and junior officers under Article 95 of the Military Penal Code. Star columnist Mehmet Altan responded to Monday's speech with claims that Basbug could be charged under Turkey's Penal Code for interfering with the Ergenekon investigation and influencing the judiciary. Basbug has rejected claims in the media that some military officers threatened to resign in reaction to the detentions and arrests of colleagues, and harshly criticized a recent seizure by police of a civilian truck carrying hand grenades for the military. Police seized the truck on March 10 on a tip that the truck was carrying weapons to be used in violence to be carried out in the southeastern city of Mus during Newroz, though t was later announced that the military had clarified the incident and that no investigation would be launched. Basbug also defended his relationship with President Gul and Prime Minister Erdogan, saying there is nothing inappropriate in the state of civil-military relations and that future disputes would be settled within the same framework of the meeting the three held following last month's mass detentions and arrests of top officers. Baykal's remarks follow criticism from CHP leader Deniz Baykal, who has openly questioned what he refers to as the "bargaining" between the government and the military. For a good briefing of the Ergenekon investigation (up to March 9) and some background into past military coups, see Bilgi University Professor Ilter Turan's analysis released in conjunction with the German Marshall Fund's "On Turkey" series. Accordiong to CNN Türk, Erikel is the lawyer of Lieutenants Noyan Çalıkuşu, Eren Mumcu, Önder Koç,Hasan Hüseyin Uçar, Mehmet Ali Çelebi ile Neriman Aydın, Kemal Aydın, Durmuş Ali Özoğlu, İbrahim Özcan and Hamza Demir, defendants in the second Ergenekon case. The lawyer was said to be among the ten people arrested and being interrogated on Monday.